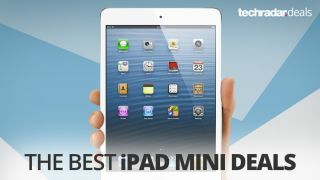 Apple's diminutive tablet is almost flawless in so many ways, so we've picked out all the cheapest iPad mini prices so you can find get the best deal on one. The series is getting on a bit now, but at least the latest iteration, the Apple iPad mini 4 is still in production. We're certainly ready for a new one by now though. At least father time's passing means prices continue to fall. The design of the iPad mini is still the best in the tablet category, with no Android tablet really coming close in this class. The fast processor and premium design makes it a great looking tablet, too, and the Retina display on the newer models is simply stunning. On top of that, you're getting an excellent OS and even gaming is sensational on this tablet. In short, it's the best 7-inch tablet out there. So here are all the best iPad sale prices so you can grab the best money-saving deal available. Apple has finally revealed its first new iPad Mini since 2015's iPad Mini 4. It's not called the iPad Mini 5 though, Apple has instead opted to simply call it the iPad Mini, retailers are likely to call it the iPad Mini (2019) or all-new iPad Mini to help differentiate it from the oldest version though. It shouldn't be hard to spot it though as the new iPad Mini (2019) will be the one with a starting price of $399 / £399 / AU$599 / AED 1599. Of course, the device itself has benefited from upgraded spec and a better screen over the older models, although you'd be forgiven for not seeing much difference in the look of the device. The stunning new retina screen has a 2048 x 1536 resolution, which is seriously intense for a 7.9-inch screen. The battery will keep you going for a superb 10 hours of web surfing and media playback. You're getting most up-to-date OS and brand new A12 Bionic Chip that even outstrips the most recent regular 9.7-inch iPad. If the regular iPads are a bit too big for you, but you want something bigger than your phone for long reads, browsing the net or watching video content, the latest iPad Mini is going to take some beating as one of the best devices you can get. One of the major changes with the iPad mini 4 over the older version is its design. It may look the same, but it's been slimmed down from 7.5mm to a wafer thin 6.1mm. It's also now more powerful, has a stunning screen and the battery is still a 10-hour beast. The A8 processor is a good step up from the A7 inside the mini 3 so if you're going to play 3D games or throw around some of the more hefty iPad apps from the App Store, this is certainly a solid option. The price will start to drop more now that the new 2019 iPad Mini has landed. For a while though, you might find prices aren't a million miles apart, meaning you might want to spend a bit more on the newest version for the extra speed and higher resolution screen.